NewsFire 1.3 (v49) is now available for download. This beta release fixes some parsing bugs with RDF feeds and with XHTML encoded content in Atom feeds. Spotlight indexing performance has also been improved. Feature-wise, the only change is a revision of the add feed panel. Firstly, you can now add feeds directly to a group via a pop up menu. Additionally, the panel now does a certain amount of auto-discovery. If you type in a valid feed URL, the name field will be auto-filled. 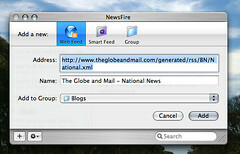 You can also type in a URL fragment and NewsFire will try and discover a feed for that address. For example, if you type in “apple.com”, NewsFire will expand this to “http://wdirect.apple.com/main/rss/hotnews/hotnews.rss”. 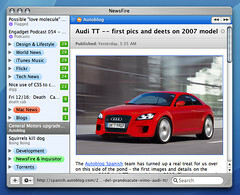 NewsFire 1.3 (v47) beta is now available for download. This beta addresses some parsing errors and animation glitches in v46. NewsFire 1.3 (v46) beta is now available for download. As noted in my previous posting, the most obvious change in v46 is a new streamlined visual style for the application. There are also changes to menu layouts, a few minor feature additions (support for Atom enclosures, support for author tags, the ability to email an article, the ability to open all unread articles in the web browser), and a new, more fault-tolerant RSS/Atom parser. This is not a feature-complete release of 1.3. It is being released to get feedback on the changes and (primarily) to debug/stress-test the new parser. Other features will be added incrementally in the coming weeks. As with NewsFire 1.2, Mac OS X Tiger is required. NewsFire 1.3 is currently underway. As you can see from this screenshot, the aesthetic of the application has been tweaked. At present, most other changes are internal, with a brand new RSS/Atom parser being the most significant. There are a few other features that are planned but not yet finished (BitTorrent download support, per-feed exclusion rules). As always, I’m receptive to feature suggestions users may have – now being the best time to make any requests.